An impassioned attack on cruelty in Pennsylvania's Eastern Penitentiary. 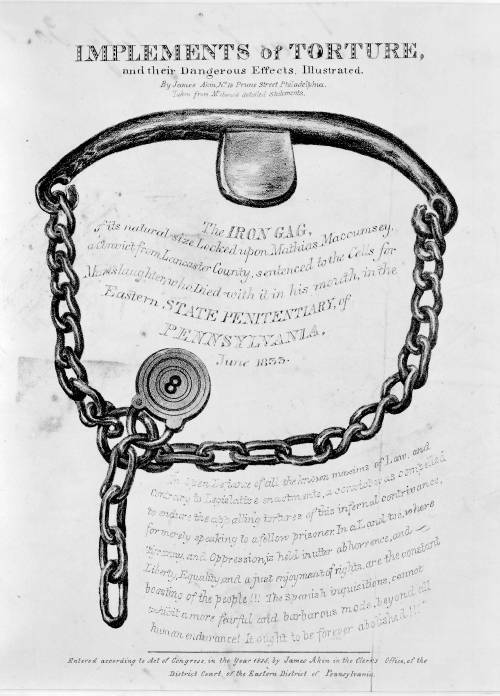 Akin presents a life-size, detailed rendering of an iron gag, "Locked upon Mathias Maccumsey, a Convict from Lancaster County, sentenced to the Cells for Manslaughter; who Died with it in his mouth..." Maccumsey's death, attributed to the iron gag, figured prominently in the report of the joint committee of the Pennsylvania Legislature investigating alleged abuses and atrocities by warden Samuel R. Wood and prison personnel. This report was delivered in March 1835. "In Open Defiance of all the known maxims of Law, and Contrary to Legislative enactments, a convict was compelled to endure the appalling tortures of this infernal contrivance, for merely speaking to a fellow prisoner. In a Land too, where Tyranny and Oppression, is held in utter abhorrence, and Liberty, Equality, and just enjoyment of rights, are the constant boasting of the people!!! The Spanish inquisitions, cannot exhibit a more fearful and barbarous mode, beyond all human endurance! It ought to be forever abolished!!!"